"Guide to Optimally Deliver Video in the Enterprise"
What is the right way to deliver enterprise video? There are, of course, many ways to get video delivery wrong. The right way to deliver enterprise video is to implement a software-defined enterprise content delivery network (SD ECDN). 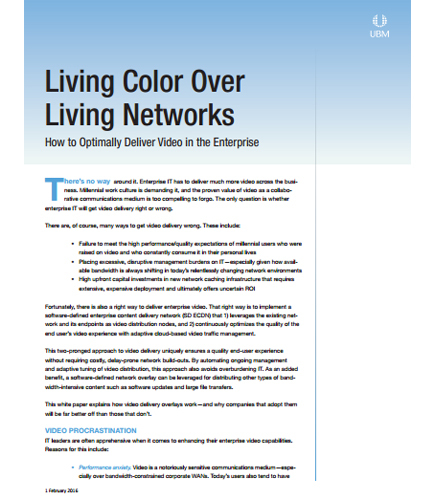 Learn more about how to deliver videos to the enterprises cost effectively and efficiently. How SD ECDN technology can fulfill your enterprise video requirements. Why and how you should enhance your enterprise video capabilities. This white paper explains how video delivery overlays work—and why companies that adopt them will be far better off than those that don’t. Enterprise content management (ECM) is the systematic process of collecting and organizing information of an organization that is used by a designated audience—business executives, customers. The term encompasses the strategies, methods, and tools used to capture, manage, store, preserve, and deliver information supporting key organizational processes through its entire lifecycle. It is not enough to ‘manage’ content.